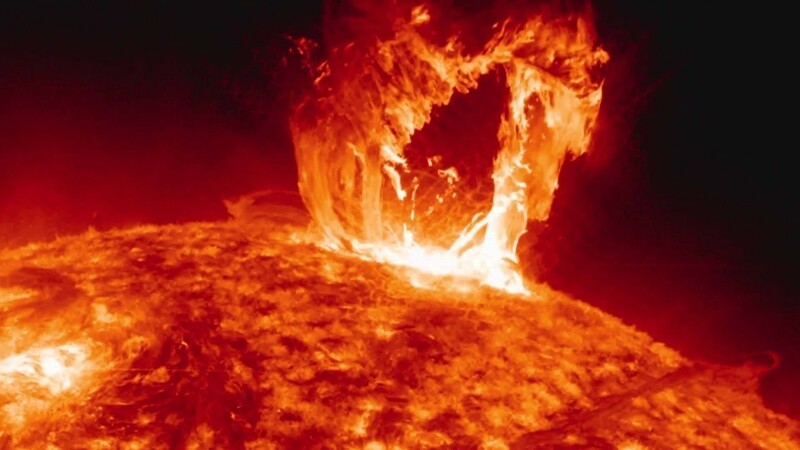 Yesterday’s post about Earth’s changing mass raised similar questions about the Sun. In the Sun’s case we know that it’s losing mass, and at a rate fast enough that it’s forced us to change the way we measure astronomical distances. The Sun loses mass in two major ways. The first is through solar wind. The surface of the Sun is hot enough that electrons and protons boil off its surface and stream away from the Sun, generating a “wind” of ionized particles. When those particles strike Earth’s upper atmosphere they can produce aurora. The solar wind varies a bit in intensity, but from satellite observations we know that the Sun loses about 1.5 million tonnes of material each second due to solar wind. The second way the Sun loses mass is through nuclear fusion. The Sun fuses hydrogen into helium in its core, producing its life-giving glow over billions of years. The production of helium transforms some of the hydrogen’s mass into energy, which radiates away from the Sun in the form of light and neutrinos. By observing just how much energy the Sun radiates, and using Einstein’s equation relating mass and energy, we find the Sun loses about 4 million tonnes of mass each second due to fusion. So the Sun loses about 5.5 million tonnes of mass every second, or about 174 trillion tonnes of mass every year. That’s a lot of mass, but compared to the total mass of the Sun it’s negligible. The Sun will keep shining for another 5 billion years, and by that time it will have lost only about 0.034% of its current mass. While the amount of mass loss is negligible, it isn’t zero, and it has an effect on Earth’s orbit. As the Sun loses mass its gravitational pull on the Earth weakens over time. As a result, Earth is receding slightly from the Sun. Because of solar mass loss the Earth’s distance from the Sun increases by about 1.6 centimeters per year. In astronomy, one of the ways we measure distance is through the astronomical unit, which has traditionally been defined as the distance from the Sun to the Earth. For most of astronomical history the changing distance of Earth was too small to consider, and so the astronomical unit could be considered a constant. But over time our measurement of this distance has become astoundingly accurate, and currently has a precision of about 3 parts per billion. This is accurate enough to observe the gradual increase in distance. So in 2012 the astronomical unit was defined as fixed constant. As a result the Earth is slightly more than 1 astronomical unit away from the Sun. If we keep moving away from the sun in this manner, will we be far enough to be saved from the sun when it gets to it’s red giant phase? I seem to recall a team in the UK who thought for a while that this was the case but when they redid their calculations taking into account tidal effects with an expanded Sun it turned out that Earth is almost certainly doomed. Some have considered the idea of moving an asteroid so that it passes close to the Earth at regular intervals over millions of years so that its tiny gravity is enough, over time, to move the Earth slowly outwards. Highly speculative I would have thought not least because you wouldn’t want the asteroid to hit the Earth but if it doesn’t get close enough then it has no effect. We wont be here by that time anyway. We will be on another planet, polluting, bickering and doing science. Simple computation says no. If the rate of orbit expansion stays constant at 1.6 cm./yr., then the Earth recedes from the sun at 1.6 billion cm./billion years. 1.6 billion cm. is 16 million meters or 16,000 km. (10,000 miles for Americans). Changing an orbital distance of 150 million km. by a few tens of thousands of km. will not make any difference. I’ve read that the sun’s power output/luminosity is also (very gradually) increasing over time. So it’s believed that the Earth will become uninhabitable due to the increased solar radiation long before our star actually begins to swell into its red giant phase. It’s all theory’s and guess work. It won’t stay constant. Gravity has an inverse square relationship over distance. So the further we move away, the faster we move away. All entertaining info and discussion, but we will probably be hit by an asteroid before the Sun changes enough to fry the Earth. I think the statistical chance of the Earth being massively impacted before the next Billion years is likely. Does this response take into account the mass that the Sun GAINS by sweeping up dust, gas, stray comets, etc. in its travels? Any gains from things like comets, etc. is negligible compared to the mass loss. but shouldn’t the sun-earth distance yearly increase be itself accelerating as the gravitational pull decreases with each passing year? If the sun is losing 174 trillion tons of mass annually and it is 6.6 sextillion tons, if the solar system is around 4.6 billions years old, the mass of the sun at the beginning could be 120 times what it is now. That means Mercury shouldn’t exist because it would have fallen into the sun shortly after the formation of the solar system The mass of the sun would have been so great that Venus and Earth would have been in danger of falling into the sun too. Too many people take the word of a scientist on face value and don’t do further investigation of a claim. Let’s do some very rough math. 1 metric tonne is 1000 kg, or 103 174 trillion is roughly 200 trillion, or 2 x 1014 (A trillion is 1012). 4.6 billion is about 5 billion, or 5 x 109. So multiplying it all we get about 1027 kilograms lost over the life of the Sun. The Sun has a current mass of 2 x 1030, so taking the fraction we get 0.005, which is nowhere near 120 times its current mass.